Shaking Water Baths There are 5 products. 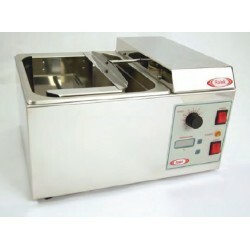 LABEC Multi-purpose Water Bath has versatile usability and applications. Purchased as a full set or as a basic water bath with optional attachments. By attaching or detaching the modular functional parts such as immersion circulating bath, soxhelt water bath and shaking water bath to the basic unit, this can be used for multi purposes. 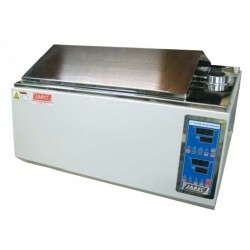 LABEC digital precise Refrigerated Shaking Water Bath contains a electronically controlled shaking mechanism which provides quiet reciprocating motion and precise speed control within the temperature range 0°C to +100°C. 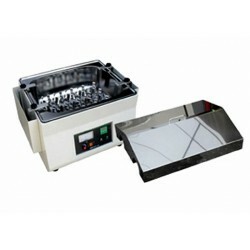 (Ambient +5°C to 45°C) LABEC Shaking Thaw Bath is specially designed for thawing plasma products. Manufactured with high quality stainless steel interior and a powder coated steel finish for easy maintenance excellent durability. 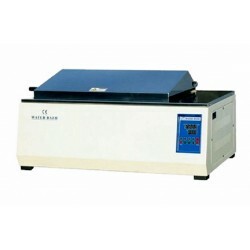 The Ratek SWB20D shaking waterbath provides a large shaking platform to agitate samples whilst precision controlled temperature is applied. The digital PID control ensures accurate and stable temperature control from ambient +5° to 99.9°C, whilst the platform speed is controlled by Ratek’s smooth, repeatable and near-silent belt drive system.